Greetings from somewhere on the road between Dallas and Bowling Green, Kentucky. More than likely, we're probably in Arkansas, though there is a slim chance we're in Tennessee. Since we are on our Christmas road trip, I decided there was a large need for on-the-road travel bentos. And since we are traveling in my car and I really don't like crumbs or stickiness in my car (seriously, the kids don't eat in the car unless we are on a road trip), I tried my hand at fairly non-messy bentos. Lest you think the kids don't have any treats, trust me, we have a cooler full of goodies. I just figured any kind of cookie or granola bar would get soft and mushy in the bentos, so those kinds of things are packed in separate containers. We have granola bars, breakfast bars, chips, and each of the kids got to pick some sort of random candy from the Dollar Tree. I also have a container full of pineapple, another full of grapes, apple slices (on sale at Kroger, even though I usually don't like presliced fruit), bananas, cheese, crackers and pepperonis, lots of bottled waters, yogurt, juice, etc. I also have more sandwiches for the kids, as well as ones for Shaun & I. We're hoping to minimize the stops, since the weather seems questionable into Tennessee and Kentucky, and we want to get as far as we can before night sets in. 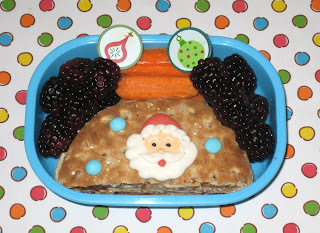 Ben has a cream cheese & strawberry jam sandwich on multigrain sandwich rounds, carrot sticks and blackberry kebabs. It's decorated with a few of my Christmas picks and a really cute candy Santa that my mom sent me. I think they are supposed to be cupcake toppers. 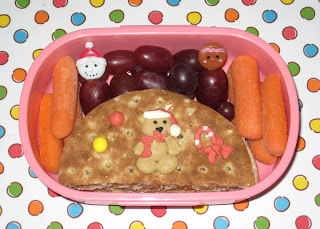 Faith still doesn't care for blackberries, so she has the same sandwich and carrots as Ben, but she opted for grapes. Hers is topped with a candy teddy bear and candy cane. Hoping both of these aren't too messy! While we are on the Christmas theme, feel free to check out our Gingerbread Pop-Tart Brownies and leave a comment to win a $100 Visa gift card! I could use some fun holiday stories for the *very* long drive! Trust me ...we knew your kids were not deprived of car snacks. 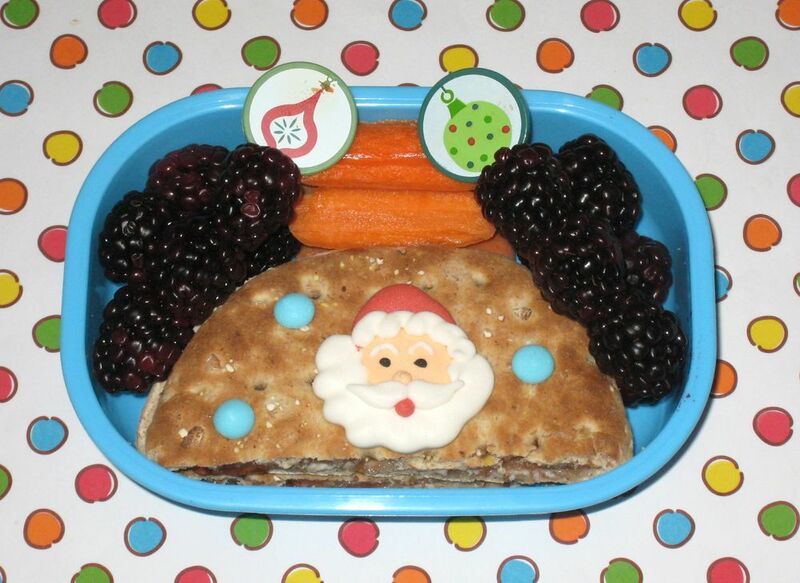 Any bento mom would not let her kids do that! Hehe! 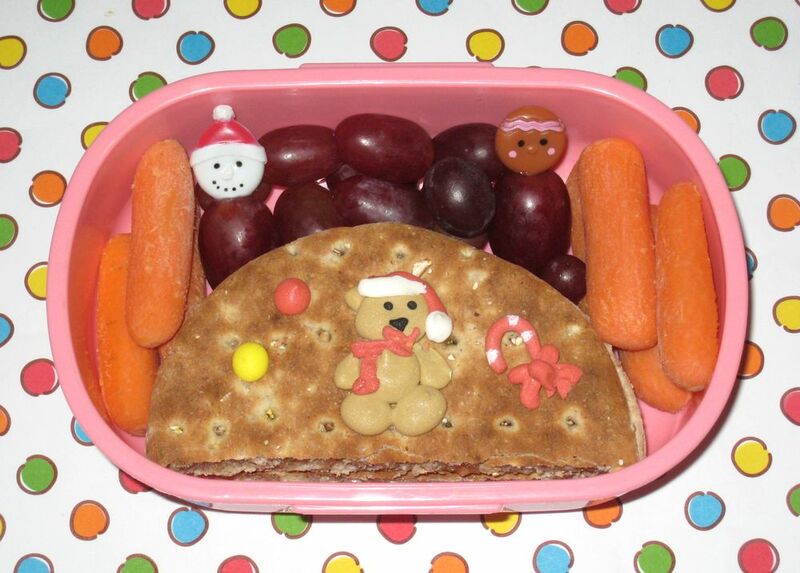 I have the stuff to do a Christmas bento...I just have to get myself going on it! I love these two! Made me smile! So cute! I love the little candy toppers :D I hope you guys are making it safely to your holiday destination!